Yesterday I saw a woman opening an underground garbage container with a key card. Was it my imagination, or did some inner mechanism actually weigh the plastic bag she was disposing of before it dropped it onto the other trash with a thudding sound? When the brain encounters an unknown event, it searches for something to compare the experience to. What it (mine) came up with was the image of a confined monkey presenting its banana peel to a carer for inspection. The second, more frightening search result my brain delivered was the notion that this monkey could be me. If a fellow citizen was put in a situation in which she had to identify herself in order to dispose of her trash, it could as well be me. I had been walking in a social housing area near the waterfront of the Ij in Amsterdam Noord. Back home, across the water, I googled the phenomenon of the waste disposal card. 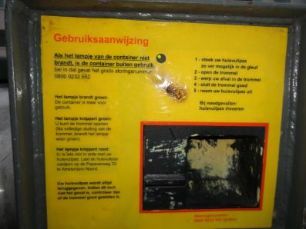 It turned out that in the whole district of Noord, and only in that district, the garbage containers are locked and inhabitants are required to use a key card to open them. Why was this so? And why exclusively there? The only thing I could think of that sets Noord apart from the rest of the city is the water of the river. And the fact that the inhabitants are generally somewhat poorer than in other districts, though not poorer than in Amsterdam Zuid-Oost, a district that is also divided from the rest of the city, in that case by the land belonging to a different municipality. Though all this may reveal something about poverty and physical separation, it doesn't explain why the waste containers in Amsterdam Noord are locked. The municipal website gives information about how inhabitants can 'apply' for a waste disposal card. They are required to fill in their name and address on an online form (email address and phone number are optional). People who have just moved to a rental in the neighbourhood can apply for a new card - the website keeps stressing that it's 'free' - if the previous tenants have not left theirs behind. The old card will then be made 'invalid'. It matters, apparently, who disposes of garbage. Though extensive information is given about how inhabitants can obtain a waste key card, not a clue can be found as to why the municipality decided to instate controlled garbage disposal in Noord. No one took the trouble to spend a few words on the website to explain to the inhabitants why this system is operative, a system for which these inhabitants pay in the form of waste tax. If a person disposes of a garbage bag in a waste container on a street corner in a neighbourhood, that person is probably an inhabitant of that neighbourhood. And what would it matter if that person was an inhabitant of another neighbourhood? What deep seated intolerance for the neighbour lies at the heart of this controlled waste disposal system? Exactly there where otherness matters least and privacy matters most, the municipality differentiates and exposes. The monkey only goes along with the game if it is rewarded. Since the people in Amsterdam Noord have no choice - they'd be punished in the form of a fine if they disposed of their garbage in any other way - there is no need for a reward. Superfluously, the city gives waste disposal card holders treats for good behaviour anyway. They receive a discount for a visit to the 'A'dam Lookout', the skydek of the former Shell Tower on the waterfront. For 'only € 7,50' they are allowed a bird's eye view of the city. Or they are treated to a free movie at the Eye Film Institute next to the tower. Eerily, these rewards distract the inhabitants from anything to do with waste disposal: the cleanliness of the view from above, the picturesque, the imaginary immaterial space of film. Now that the brain has processed the new phenomenon, it produces a more developed image: that of the end of humanity. On a cold day a soft wind is blowing over the spacious, desolate waterfront housing area. A woman appears, alone, carrying a plastic bag. Resigned, without a whisper of remonstrance, the woman slides a key card into a slot and has her plastic bag inspected through the system that she herself has been forced to pay for. And that's the end of it. Just like that. On a winter's day in Amsterdam Noord.